We follow the OCR A specification at A Level. This specification places chemical content and practical skills as a high priority, with students’ learning their A Level content through integration of practical activities across different concepts. This style of course develops a vast range of chemistry skills in addition to comprehension of content, which is highly favoured by universities. Particularly well developed skills are analytical thinking, scientific numeracy and a deep understanding of scientific method. A Level students will have ample opportunity to complete core practical activities throughout both years in lessons and use these to develop competency in ‘How Science Works’ skills, which go towards their practical certificate and are assessed during their written examinations. In Year 12 students study a wide range of topics from calculating the amount of chemicals present, synthesising organic chemicals to the structure and periodicity of the periodic table. In Year 13 this is expanded to cover the design of new pharmaceutical drugs, organic reactions, the phenomena of transition metals and physical chemistry. Lesson structure varies from practical tasks, research opportunities, presentations and to learning more traditional theory with vast opportunity to stretch their thinking and understanding. All lessons are taught by experienced, chemistry specialists and are designed to stretch and challenge students, with students expected to study content prior to learning it in class. Throughout the year the chemistry department co-ordinates with the University of Birmingham to attend lectures and site visits e.g. to mines give the opportunity to explore the real world of chemistry. This is in addition to having guest speakers in lessons e.g. a chemical engineer or graduates working at Cadbury factory. 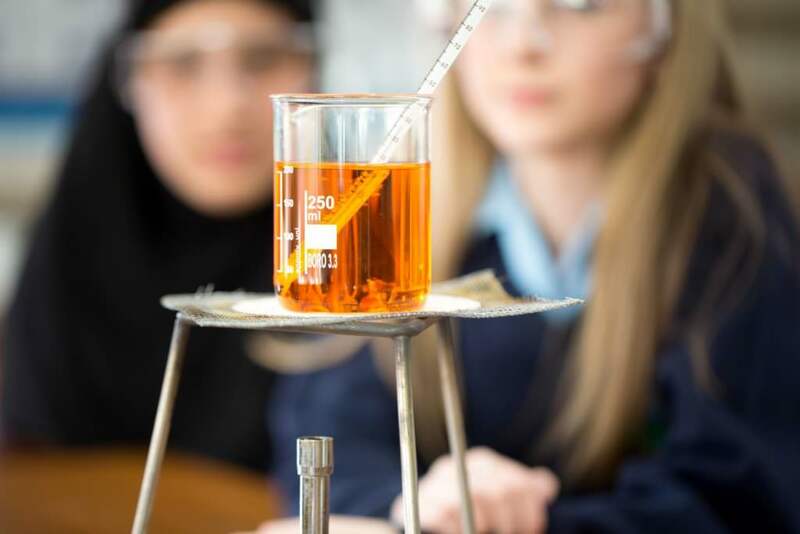 To gain entry to the course it is expected that students have achieved a 7 grade at GCSE Science (additional or separates) and grade 6 at GCSE mathematics. This is to ensure that are able to access the increased mathematical content (20% of the marks) of the course. Chemistry is a vital A Level to obtain for future studies in medicine, dentistry, veterinary, optometry, audiology, biochemistry, chemistry. It is also incredibly useful for many more studies, such as law or history.